Back in the “Before” days, I paddled with a Euro blade and thought it was entirely adequate. Then came the day that Joe placed a shouldered Greenland paddle... one of his creations... in my hands. I’ve never looked back! Greenland paddles in general give more control and paddling options than the Euro blade. Joe’s paddles specifically are beautifully carved, made to fit and finished correctly (with Tung Oil). I bought that first paddle he put in my hands and have since added A Storm Paddle and a Rolling Stick to my collection from Joe. If you love paddling, don’t go cheap on the paddle. It is your first contact with the water. 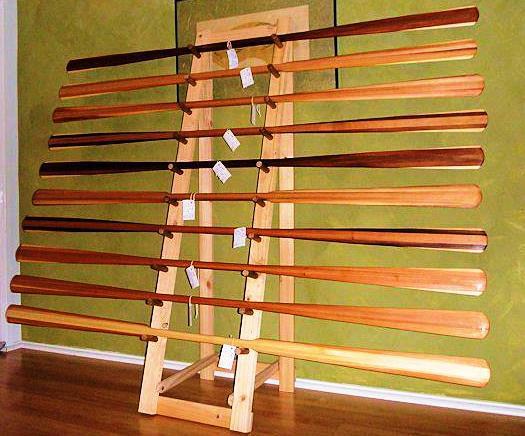 Joe’s Greenland sticks are both a pleasure to look at (mine are in the living room) and a pleasure to paddle. I met Joe literally days after getting my first kayak. He was attempting a world record paddle around Vancouver Island. Inspired by his antics, I just had to meet him. I trailed behind him as he approached the finish line where he was greeted by Colin Angus who handed him a cold beer. I had the pleasure of hearing his stories first hand that evening around camp with other paddlers including Helen Wilson. Since, Joe has made me numerous paddles and I am also the proud owner of his spare paddle he took around the island in setting the speed record. Joe O’ Paddles have been with me since the very start of my paddling journey and i give credit to the paddle maker for inspiring me to be the best kayaker I can be. I love my beautiful three-piece Joe O’ set of paddles. Extra light Greenland paddle, Transition Stick and Norsaq (Rolling Stick). Not only are these fun to play with for rolling practice but I take my Greenland paddle with me often on the water. Sometimes as my primary paddle, especially for distance paddles since it is much easier on my shoulders. I love my paddle Joe! I’m not sure how i met Joe but somehow I ended up paddling with him in BC. I had my shiny new carbon fiber paddle that I loved and Joe has a stick that he called a paddle. I felt very sorry for him... and hoped that one day he would be able to afford a paddle as nice as mine. I was very new to paddling and Joe offered his “paddle” to me partway through our trip, telling me I could paddle faster with it. I was skeptical to say the least. I was pretty sure he just wanted to try my beautiful new carbon fiber paddle so I agreed to the swap. We did some tests with my GPS and sure enough, I could go faster with it. And not only that, my shoulders and wrists were not hurting. CRAZY! Days later, we went and shopping for wood and I picked out a 2X4 of cedar. We took it to my Dad’s basement and Joe cut it into a paddle-ish shape. Hw worked away at it and whittled it down into something so light and so perfect and then oiled it up for me. I love that paddle... in fact, it’s the only one I use. It’s taken me on some amazing kayak trips. It matches my cedar strip kayak perfectly and i would never paddle with anything else! I got my first Greenland Paddle from Joe two years ago and it has been quite the affair ever snce. Every time I dip the blade into the water, I slip into kayaking bliss. I got my paddle finished with tung oil and I love the smell of it and it was like Christmas opening the parcel u to find two gorgeous Greenland paddles ( the second being a Storm Paddle)... Yee Haw! They are perfectly made and I love paddling with them. Slices through the water like butter. I’m from Truckee California but now live in Reno. Joe o’ built me a paddle a few years back and he was happy to carve the loom a little larger in diameter than the usual as I have loooooong hands. I’ve paddled that puppy quite a few laps around Lake Tahoe, hundreds of miles in the Sea of Cortez and dozens of laps on my hometown lake, Donner Lake. I like the fact that it has nearly no impact on my joints and I can just crank on that sing all day. it is sweet for rolling, glides on the surface well and is basically one badass paddle. It is coming with me back to Baja again in a couple months. In the meantime, I’ll be paddling in the icy chunks on Donner Lake. That O’Blenis paddle and I have the dubious distinction of very likely the only ones to infamous Cortez mudflats section 3 times! Mud up to your eyeballs. You see, I have a thing for seeing that endangered Vaquita dolphin that lives there as much as possible before it goes extinct. Or better yet, trying to keep it from heading down that path to begin with. 3 trips, one Vasquita sighting...and one VERY muddy paddle! Here is my story... First trip with a GP! On a crisp fall morning, the colours of the new day can just be seen over the top of the Sleeping Giant (Thunder Bay area landmark here on Lake Superior). I left my home in Thunder bay, Ontario just hours ago and already i was relaxed. I raise my head up, looked through the screen of my tent. I can make out the bows of the kayaks as they rest silently among the tall grass at the water’s edge. I could smell the damp air through the leftover smoke from last night’s fire. I wondered what the people back in the city were doing at this very moment? They couldn’t possibly see the world as I was seeing it right now. They couldn’t even imagine the world I was in at that very moment. I slowly opened the zipper of my tent, not wanting to disturb anyone else. I could feel the morning air sweeping over my face. A shiver ran down my spine as I slipped out from the warm sleeping bag and pulled my jacket over my shoulders. I was going to savor this moment. As I crawled out of my tent, the sun came into view over the Sleeping giant. It’s bright orange glow already had heat to it. A new day, a new adventure. As I walked toward the lake, the dew on the ground shone as though a million candles had been lit at the same time. Each droplet reflected the suns light. The colours of the kayaks could now clearly be seen as I drew closer. The dew on the boats made them look as though they had been polished to a brilliant sheen. I paused for a moment and just took it all in. Thinking about the previous day brought me back to reality. Where am I? What had I gone through yesterday? How am I still alive? The lake I was looking at, the largest fresh water lake in the world (By surface area...Lake Baikal in Russia being larger by volume). Its vastness dwarfs the size of some entire nations. Yesterday she was mad. Yesterday, the wind had blown up to a steady 20 kph. At first it wasn’t too bad. The kayaks were pretty heavy so the waves were not pushing us around much. As we rounded the north-eastern tip of Pie Island we could see nothing but open water...and the water was huge. The trees on the island had been protecting us from the worst thing a paddler can face... gusting wind. I don’t have to go fast when I paddle and I don’t have to go far. But i like to pick a speed and just go. Nothing to me is more discouraging than seeing that giant bear paw of agitated water, steaming ahead, full force, until the wind hits you like a freight train and you come to a grinding halt. This time something was different. The waves were nearly a meter--- okay. The wind was gusting like crazy and the water was freezing cold. Par for the course. But something was different. Even though I was almost dead stopped and being tossed around like a cork in a washing machine, I was completely relaxed. I was paddling at the same speed. The paddle dipped effortlessly into the water, just where I wanted it to and it didn’t fuss or stray. I paused for a moment, extended the paddle out to its furthest reach and braced myself as I examined the group. All could be accounted for. We approached the last bay and the wind was howling. I again braced and took a look around. As I was looking around, my kayak had weather veined and was now broadside to the waves. Usually kind of fun in big water like this. I noticed that a rope had come loose and the tail end was dragging in the water. I grabbed for it and at that moment, I fell off the back side of a wave. Leaning into the hull, I tried to stop from capsizing but fell back and into the frigid, dark water. Before I could even think about it, I spread my arms out, put my head back and next thing I saw were the clouds. The blade found the horizon, I’d just come back up. Folks had gathered around me and everyone had a good laugh. We continued on to the beach and surfed right up onto shore. The very land i was standing on at this moment. It was a tumultuous nightmare just hours ago... but here it sits... peaceful, indifferent. I glance over at the kayaks again. Resting atop the decks were our custom made Greenland paddles. They were like lit up landing strips in the morning sun. The depth and beauty of the wood made it hard to think that such pieces of art could have actually been the only reason I was able to even stand on this earth and enjoy the beauty before me. Knowing that it was designed and built just for me, kept me confident, when i lay staring through a foot of icy 4 degree water. The smooth finish and subtle curve of the paddle make it easy to extend to its full length and hold you steady in any conditions. The longer, more slender blade does not bite into the wind like a Euro-style paddle so when the winds gust, you can still hold a comfortable pace without altering your paddling technique. If you have come prepared with a good roll, and the unexpected happens, the Greenland paddle will act predictably, even if you are snatching it from your deck lines. It always lands face up and is ready for when you need to reply on it. When surfing or steering, you can easily slide your hands along the blade to thrust the paddle over 3 feet into the water, allowing for the best manoeuvrability in any boat. The blade dips deep enough into the water during normal paddling that 2 atmospheres of pressure are being applied to it, like second gear on a bike, with the same effort, you go faster! With only a few questions and a little patience, you could own a paddle that has been built to your exact specifications. Whatever your needs or desires, Joe O’ Paddles can hook you up! There is no reason you should be paddling with anything but a custom made Greenland style paddle! Been paddling for a few year and I started with an old spruce stick that came with my slick Nordkapp kayak. I bought a beautiful new Valley Anas Acuta last year and I have been desiring a new paddle. Fast forward to Christmas morning and my wife surprises me with a real treat... a new Joe O’ Greenland Paddle! it is beautiful, absolutely perfect. I could not be happier! Me? I’m pleased as punch! Mmmmm.... how many ways can I say “I love my Greenland Paddle”? I love the way it feels (silky smooth), I love the way it looks (stunning), I love how light it is, but most of all I love how it has allowed me to start Paddling again! A number of years ago I had wrist surgery and was forced to stop paddling. Then when I thought all was well, I developed shoulder injuries and thought that a world of paddling was forever over. Then I was introduced to Joe’s Greenland paddles! I was somewhat leery of paddling again and didn’t think a paddle of any sort would solve my problems. With a little persistence from my sister (who just happens t be Joe’s other half), I floated into the pool to try some rolling with my Joe O’ paddle...Voila! I fell in love1 What a paddle that is! Greenland rolling became my new favorite thing and before I knew it, I was on the lakes, injury free with my new Greenland stick! Haven’t looked back yet and likely never will. My Greenland paddle has opened up a world I forgot how much I loved. Thanks Joe O’ ...one can never have too many sticks! I’ve been using Joe’s paddles on Great Slave Lake the last two seasons now and never leave shore without it. My first one and I am hooked. Great way to paddle...the Joe O’ way! I first saw Joe’s paddles in the hands of our local expert instructor. I was immediately smitten with the cool, old-world craftsmanship that all guys really dig. Like my handmade classical guitar, my custom paddles speak a human message that can’t come from a machine. Knowing the builder and seeing the original wood blank transformed tells me the story of my new instrument. And my new paddle smells like a sauna! Bonus! My husband and I both have a Joe O’ Greenland paddle. We have both learned our Greenland rolling and paddling skills using these beautiful sticks. They are well crafted and a pleasure to use. Just oil them once in awhile and they maintain their beauty. We thank you Joe for introducing us to Greenland style paddling.. I love my Joe O’ Greenland paddles for many reasons. Yes, I gave it a 10. It is true that many reviews have high marks, but in my case, I mostly only review things I like. I have tried many paddles I don't like, and many that are acceptable. The bent shaft O'Blenis made me is spectacular. I will compare it to my Grey Owl Marathon, which was my favourite bent (also rates a 10!) until it was trumped. The top grip is great on both, full and round so as to produce little hand fatigue or pressure points. The top grip has matching grain which is very attractive. The shaft is ovaled and a suitable diameter on both. The O'Blenis looks to have a laminated cedar shaft with ash facings for durability. The blade is a bit smaller on the O'Blenis paddle, allowing for a higher cadence, and better for long distances, especially in a loaded boat. The blade shape is similar to a Zav in that there are pronounced shoulders. The Grey Owl blade is obviously prettier, but the O'Blenis has a pleasing contrast of dark and light laminations. The O'Blenis paddle has a curved bend at the elbow, and somewhat less angle than the 14 degree grey owl. The blade of the O'Blenis paddle is covered in s-glass which should make it durable, but there is no edging, which suggests that pushing off rocks is a poor idea. I inadvertently stepped on mine and it flexed nicely with no damage while I cringed in fear. The O'Blenis paddle is about 4 oz lighter (my kitchen scale says 16.5oz). The workmanship is first rate, with a smooth finish throughout and an excellent job on the glassing of the blade. In the water the paddle is noticeable in its quick recovery time, and smooth, quiet entry. I found no flutter or imbalance in the stroke, and it performs as one would expect a premium paddle to. In summary, the O'Blenis paddle will be my choice for a flatwater tripping bentshaft, and long-distance recreational races. I'm sure bigger blades are available, as he custom makes these paddles. Peter and I got out for a nice long paddle on Saturday, Peter used a Wing blade and I used your...er...my new paddle...very impressed with how fast and effortless the paddle was - it paddles as beautiful as it looks. Best of all...no wrist or shoulder pain !!! When I'm not on the water it's standing in my living room so I can sit and stare at it ! Thanks Joe, it's a true work of art !!! Thanks for the fine craftsmanship and the labour you put in to making my paddle, I am in love for the first time in my life, and its all your fault it works amazing and I think unless I'm teaching I will never use anything but this stick for the rest of my paddling career (some how I think that it will be until the day I die).